Alicia Turner, associate professor of humanities and religious studies at York University. How notions of Buddhist tolerance have been used to justify violence in Myanmar will be the topic of a lecture at Wright State University by Alicia Turner, an expert on the intersection of religion and nationalism in Southeast Asia. Turner will deliver the Piediscalzi Lecture in Religion on Thursday, April 4, from 3:30 to 5 p.m. in the Discovery Room (163) in the Student Union. The lecture is free and open to the campus community and public. Turner is associate professor of humanities and religious studies at York University in Toronto. 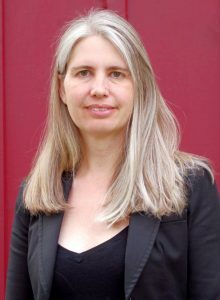 She is the author of “Saving Buddhism: Moral Community and the Impermanence of Colonial Religion.” She is also editor of The Journal of Burma Studies. Turner’s lecture is titled “The Violence of Buddhist Tolerance: Escalating Religious Difference in Myanmar/Burma.” Turner will discuss the history of the Burmese military’s attacks on the Rohingya Muslim minority in Myanmar and how notions of Buddhist tolerance have been used to justify violence against non-Buddhists. The lecture series was inaugurated in 1989 to honor Nicholas Piediscalzi, founder and the first chair of the Wright State Department of Religion. The event is sponsored by the University Honors Program and the Department of Religion, Philosophy and Classics in the College of Liberal Arts. For more information, visit wright.edu/drpc or call 937-775-2274.